I remember the first time I saw mention of this soundtrack, it was being hyped to high heavens. Burman's maddest score, over the top Bollywood mayhem, the dope for beatheads and DJs, stuff to that effect. It could only have been on eBay. 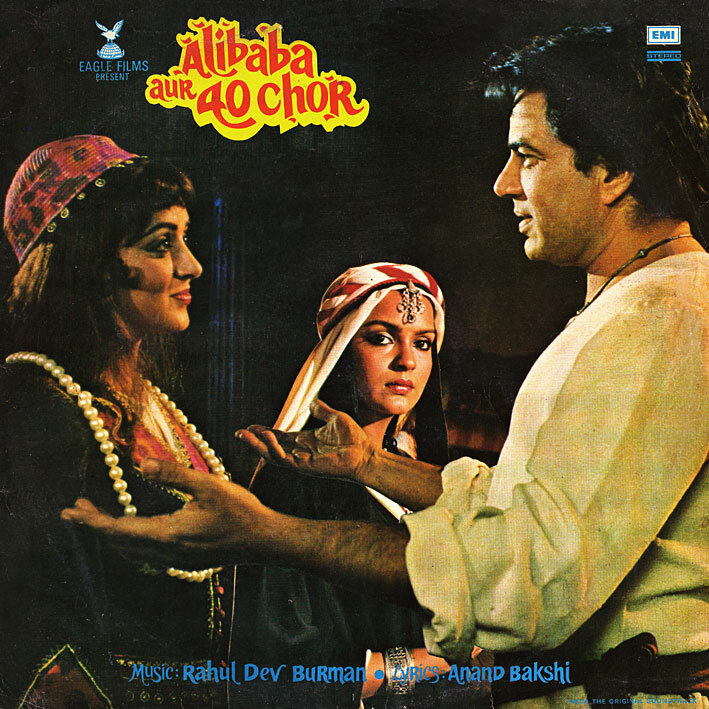 But 'Alibaba Aur 40 Chor' (a Russian/Indian coproduction) is an enjoyable record, with several good songs... though I would hardly consider them his most memorable. 'Jadugra Jadu Kar Jayega' is a nice, catchy Kishore/Asha duet, 'Sare Shaher Men' is a lively offering from Lata and Asha, and you'll be singing along to the semi-anthemic 'Khatouba' (I love the way Ali Baba's hideout magically transforms itself into a Saturday Night Fever like disco in the film clip.) There's also an odd Morricone-goes-Balkan styled 'Title Music'. The main reason why I will never part with this album though, is 'Music', one of RD's finest instrumentals. Imagine yourself alone, at night, in a secret robbers' cave, exploring it... dark, musty, mysterious; not knowing what dangers lie beyond the next cobwebbed corner... this is the music you'll be hearing. A fantastically weird and wonderful piece of ominous oriental electronica; stunning! Oh yeah, one of my favorites! Got this one just for the music, and the album's worth it just for this. I actually got chills hearing it, and could totally picture bats flying at my head when I heard that flitting sound that's repeated throughout the middle part of the track. Thanks for posting, sounds scrumptuous! Any idea where a quality DVD of this - with english subs - could be had in the USA? Hey aren't there any Rajesh Roshan's scores! He had a fantastic time in the late 70's and early 80's- Manpasand, Baaton Baaton Mein, Julie, Doosra Aadmi, Des Pardes, Mr. Natwarlal, Kaala Patthar, Yaarana, Khuddar, Kaamchor, to name a few! Sir, pls. find them for mortal souls like us. I only have a few EPs with his name on it - I'll be posting those in the not too distant future. sorry dude to be an idiot but how do i download these gems from you? not obvious to me how to do that from your website. Thanks for all your albums !!! Do you have any more Shankar Jaikishan vinyls ?. Also, do you by any chance have "An Evening In Paris" (1967) composed by them ?. Yup, there are more Shankar Jaikishans coming up - including Evening In Paris. Not entirely sure when though as it's not been ripped yet and I have quite a few other scores already lined up. Thanks PC, looking forward to those S-J albums and all the other ones !. Keep up the excellent work !!!. Hey, fantastic work man!! thanks a ton!! I was looking for songs from the movie "Amar Prem". It would be great if u could upload them. Awesome blog! Thanks a lot for the great numbers....always a pleasure to get here while surfing and find more gems. Do you have any more albums of RAVI or any of MADAN MOHAN? Amar Prem - Haven't got it. Ravi/Madan Mohan - I think I might have one or two, coming later. I wanted to invite everyone to my new Rajesh Roshan Group. I know there are many fans of this composer out there. It would be nice if you join and share your views and insights about the composer and his work. Thanks a million PC for ALL of your albums, greatly appreciated !!!!. Keep up the excellent work !!. Hello to all. I'm from Moscow. Alibaba is my favorite film. Tell me please where can I find it. I hadn't seen that. Did they not use Burman's score on the Russian version then? I have no idea where you could find it.